Last time I covered the basics of adding a single music track into Fallout 4 through the Creation Kit. This time we'll be delving a little deeper and exploring Palette tracks. This is Bethesda's way of introducing some randomness into the soundtrack. Palette tracks are created much in the same way as a single track or a silent track, except that they are made up of single and silent tracks. Palette tracks are made up of three layers, each layer playing its constituent tracks simultaneously and in a random order. This is useful for splitting up a soundtrack into its constituent parts, for playback in different orders or combinations. In a typical setup, the palette track could consist of one layer of slow, deep percussive elements, a ‘pad’ layer, and a layer of a wide range of ‘stingers’ or ‘phrases’ separated by silence. None of these files would need to be the same length. Allowing them to overlap differently each time creates more randomisation. Nothing breaks immersion for a player like hearing the same music or sounds over and over in a short space of time. This is a type of what we call 'parallel forms', however, as far as I can see, the Creation Kit has no way of introducing any sort of logic into the selection of the tracks within palette tracks. This allows for a huge amount of different combinations given a relatively small amount of assets, due to the different lengths of every sound file, as the components will very rarely overlap in exactly the same way. Of course, if the files and silences were kept identical in length, or at multiples of each other, it would be possible to create a far more percussively driven track. With longer chordal loops providing a simple chordal backbone, and shorter loops interspersed with silences creating melodic phrases over the top. Here are just two of a number of theoretical possibilities for two 24 second periods using the same 6 assets. Which setup would be appropriate would be wholly dependent on the mood we want to convey. The idea would be to load up a palette track with assets that fit the mood of the area, and let it generate different music every time the player enters. This works especially with more ambient-leaning soundtracks like those found in Fallout 4. Palette Tracks are made up of Single Tracks and Silent Tracks. Before you start to put together your Palette Track, you need to create Single Tracks for every component of your Palette Track. Don't worry about creating a Silent Track for everything instance of silence within the Palette Track. Silent Tracks can be re-used over and over in a palette track, as, well, they're all the same! These Single Tracks are set up in exactly the same way as the previous tutorial, so refer to that if you can't remember exactly how! I split up all of the instruments from my quick composition in the previous tutorial to create the components for my palette track experiment. I've followed the same naming convention as I did in the last tutorial. This is incredibly tedious. As far as I can figure out, you need to import them all one-by-one. Once you have all of your components imported into single tracks, then go ahead and create a palette track. This is done in the same way as a single track, except you choose 'palette track' from the 'Track Type' drop-down menu in the 'Music Track' dialogue box. Use the same naming convention as your component tracks, so the palette track appears next to these in any lists. Now, looking at the palette track dialogue box, we can see there are a couple of different options to single tracks. 'Duration' determines how long the palette track will randomly cycle between the tracks in each layer, before ending the palette. 'Fade-Out' determines how long before the end of the 'duration' that the palette begins to fade out. The arrows to the side of the 'Layer' box moves between each layer of the palette. Right-click in the white box below the 'Layer' arrows to add single tracks to that layer. Arrange your single tracks with the final orchestration in mind. For example, layer 1 could contain Piano and Guitar phrases, layer 2 could contain ambient string pads, and layer 3 could contain vocalisations and deep percussive elements. Adding in silent tracks to the layers alongside your component tracks will change the pace and density of the music. The order of the tracks in each layer's view can be changed with the arrows in the top-left of the box, however, this is purely for organisation. The playback within each layer is still random. Remember, generally the goal here will be to add some ambience and tone to the player's exploration of the game. We give the game away by allowing too many elements to play simultaneously too often! 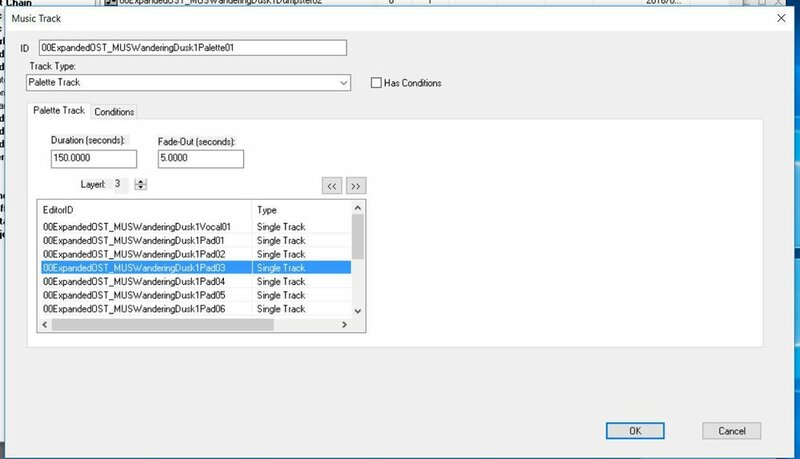 Once your palette track is created, it needs to be inserted into a Music Type, just like a single track, in order for it to be heard within the game. This is done as in the first tutorial. Palette tracks can be either set to play on their own, possibly on loop, or interspersed with single tracks. This can work quite well if a sparse palette track based around a traditional composition is played for a couple of minutes before the full single track begins. Now, as in the previous tutorial, set a cell in the Cell View window to use this music type as its default music type. Here is my example palette track in action in the game! Another, more foolproof way to use palette tracks would be to make 3 different versions of a single composition, split into three parts, giving you three different versions of the melody part, three different pad parts, and three different percussion parts, which when played over each other in the random structure of a palette track would give 27 different possible voicings of one composition, using 9 assets. Judging from the setup of the OST palette tracks in Fallout 4, I believe this is similar to how Bethesda use them. Thanks for reading, and feel free to get in touch with any further questions!